Swamp People. This show about Cajuns hunting alligators in Louisiana bayous is a thrill ride. The aluminum boats are thin and the accents are so thick that subtitles are sometimes necessary. Need I say more? Eat Pray Love is a bloated (2 hrs and 20 min), overwrought movie based on a wildly popular book. I didn't read the book, but I think it's safe to say this film adaptation did not do it any favors. Julia Roberts stars as the movie's central character, a writer from Manhattan in search of herself after the collapse of her starter marriage. She takes off on a year-long quest in which she shovels food in her mouth in Italy, learns to meditate in India, and discovers true love in Bali. The best parts of the film is when she is narrating what I assume is direct passages from the book. 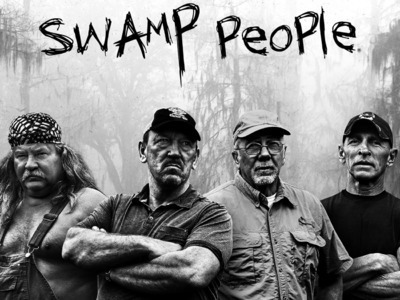 Hmmmm, the photo of Swamp People is intriguing... Is it fictional or real life? I have heard many bad things about Eat Pray Love. I only read excerpts from the book and really didn't care for it. The lady kind of turned me off, though I can't remember why. So many people I know have hated the movie, I'm not even going to try to watch it. The swamp people sounds familiar. Is that an old series. Its a shame how I stand in front of the netflix clueless of what to watch. I saw EatPrayLove and I really liked it a lot. Except it didn't end the way I thought it would have. And I agree, Eat Pray Love the movie was not great. I loved the book but I also read it right before I had kids. I might not love it as much now. But I didn't much enjoy the movie. I don't think I even finished it.